Do we ever have a winner chicken dinner picked out for you! This will be a new family favorite and it couldn’t be easier. Be sure that you watch the video tutorial now. 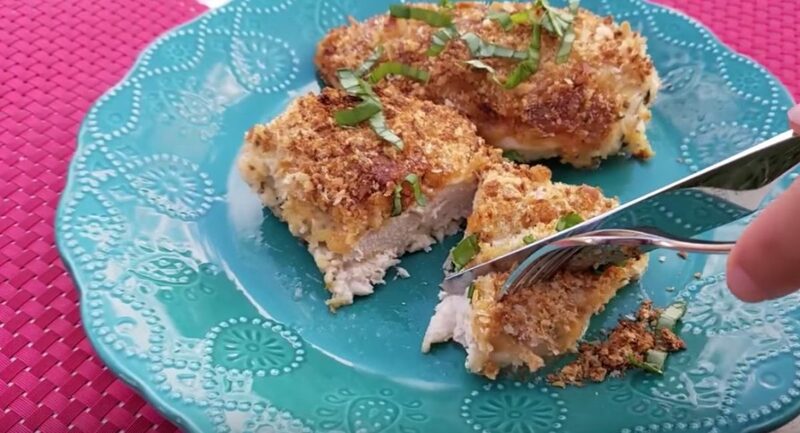 If you are looking for a winner chicken dinner, this Parmesan Crusted Chicken Breast Recipe will not disappoint. According to the creator and WHOot Contributor, Courtney Budzyn, this Chicken is super moist, comes together easily and is amazingly delicious. We’re sold and you will be too. We have included Courtney’s video tutorial and we highly recommend that you view. She shares some great tips and tricks. One of her followers that made this dish had this to say. Preheat oven to 400 degrees and line a baking dish with tin foil. In a medium bowl mix together mayo, Parmesan, garlic, spices, salt and pepper. Dip the chicken breasts in the mayo mixture coating every surface. Lightly top each chicken breast with breadcrumbs. Be sure not to use too much. Using too much may cause the breadcrumbs to burn while baking or go soggy. Bake for 30-45 minutes or until the internal temperature reads 165 degrees. Let rest for 5 minutes and enjoy! To see more winner chicken dinners, see our collection here.